These pictures from Jan Gehl's Life Between Cities show why high-rise neighborhoods seem faceless and impersonal. 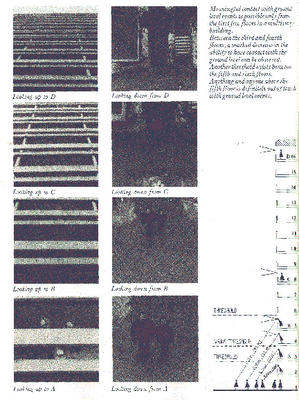 In a series of views, Gehl shows that people on the ground and in a building can see each other clearly looking down from the second floor and the fifth floor, that they can barely see each other looking down from the eight floor, and that they cannot see each other at all looking down from the sixteenth floor. I would not make the fifth floor the cutoff height, as Gehl does, since I know places where there is a sense of connection with the street even when you are on the ninth floor. But when you get higher than that, people living in a high rise have no visual connection with the surrounding community; they just look out at a distant view (unless that view is blocked by another high rise). When you walk through a traditional urban neighborhood, with buildings five or six stories high, you can see the faces of people looking out of their windows, and you can see personalizing details such as flowerpots in windows. When you walk through a high-rise neighborhood, you cannot see this sort of thing in most of the building's facade. The high rises literally are faceless and impersonal. They have all the humanity of a piece of graph paper. "Meaningful contact with ground level events is possible only from the first few floors in a multi-story building. Between the thrid and forth floor, a marked decrease in the ability to have contact with the ground level can be observed. Another threshold exists between the fifth and sixth floors. Anything and anyone above the fifth floor is definitely out of touch with ground level events." Jan Gehl, Life Between Buildings: Using Public Spaces, translated by Jo Koch (New York, Van Nostrand Reinhold, 1987) p. 100. Apart from what it says about high rises, this is generally considered the best book about how to create lively public places, and I strongly recommend it. Hey, Ethan from PPS forwarded your message to him. He was like, "I think this guy is talking about you." Thanks for talking to me again, working hard on that video and so many others! While I would agree that at some point, be it the sixth or the ninth or the xth floor, some connection is lost between those on the inside of a building and those on the street, this hardly means that, as a result, neighbhorhoods of high-rises are faceless and impersonal! For one thing, except in very rare instances (e.g., the Citicorp Building), virtually all high-rise structures ALSO have lower floors (i.e., those floors between one through six, or nine, or whatever). Thus, the real difference between most skyscrapers and low-rise buildings is that the skyscrapers have ADDITIONAL floors -- not that their lower floors are necessarily faceless and impersonal! By the way, a very good example of this is the apartment house at 40 Fifth Avenue that I've mentioned in a number of related threads here and on the TradArch mailing list. It's lower floors are gorgeous -- like a magnificent, but very accessible, townhouse -- and these floors have quite a bit of connection (windows, balconies, doors, etc.) to the street. I also have to say that I think that the connection between those inside and those on the street is actually felt, most of the time, more keenly by those inside a building rather than by those on the street. It seems to me that for those on the street, there can actually be a surprising amount of connection to higher floors (that is, if a building has traditional windows), and that this is not actually all that different from any "connection" one has with windows on lower floors (especially since people usually aren't leaning out of windows, at least these days, and windows usually have curtains, or blinds, etc., anyway). And most of the time, most people don't seem to look above the first floor in any case, even in low-rise neighborhoods (like the one I live in). I do think there is quite a significant difference though between being inside on a low floor and being inside on a high floor -- although, of course, most buildings with high floors also have low floors too! Ben: I think you are showing your New York bias. You are so accustomed to tall, impersonal buildings, that you no longer notice they are impersonal. I think most people walking on lower Fifth Av. feel that these high-rises are impersonal, because most of the building wall is made up of apartments with no personalizing touch, just as Jan Gehl says. They may just see the lower floors in the buildings next to them, but they certainly do see the impersonal higher floors when they look down the street. I get this impersonal feeling even when I walk on West End Ave, where the buildings are generally only 12 stories and are good traditional design; the entire street seems like a faceless canyon. Most people get a very different feeling when they walk on the side streets off of Fifth Ave or off of West End Ave, which are still filled with four-story row houses built in the nineteenth century. These streets feel much less impersonal; the scale of the street as a whole is much more intimate. Surely, you must notice the difference between walking on lower Fifth Ave, say in front of the Brevoort, and walking on the side streets lined with rowhouses. This is, obviously, another area where we see things very differently! It seems to me "idiosyncratic/personal" vs. "anonymous/impersonal" has nothing to do with height, per se, but with the way specific buildings have been designed (and remodeled) over the years and with the mix (or lack of mix) of structures that result. And many, if not most, “pristine” low-rise, urban row house blocks, even of traditional architecture (e.g., the “brownstone” blocks of the Upper West Side), are actually quite repetitive, monotonous, boring and impersonal ("faceless") -- especially as originally built. It isn't until such streets are enlivened with other types of buildings, including high-rises, that such blocks become less mechanical and impersonal and become more truly personal, idiosyncratic, interesting, and pretty. Generally speaking, the most personal and prettiest blocks in the lower Fifth Avenue area, for example, are just such blocks (like W. 11th St., for instance) that have been enlivened with high rises. Plus the economics of high-rises (if they have not been unduly restricted by anti-urban zoning) seems to often allow for lower floors that have a more intimate connection with the street (e.g., interesting storefronts, doctors and dentist offices, maisonettes, etc. ), while the economics of low-rises (with or without anti-urban zoning) seems to encourage set backs from the street and lower floor windows that are closed off from the street for privacy (e.g., with frosted windows, iron grills, air conditioners, curtains, blinds, etc.). And while taste is, of course, personal and subjective, similar comments about the impersonality/anonymity of many (or, even, most) low-rise neighborhoods have been made by others over the years too. So I see such a viewpoint as being the viewpoint of those observers who are actually intimately familiar with BOTH low- and high-rise neighborhoods and, thus, in a better position to compare the two. Ben: Having lived in Manhattan, just off West End Ave., I am familiar with BOTH high-rise and low-rise neigborhoods. You did not answer the question in my last post: Can't you feel the difference when you go from lower Fifth Ave. or from West End Ave. to the adjoining streets of nineteenth-century rowhouses? Can't you feel that you are moving from a more impersonal to a more intimate scale? I suggest that the great majority of people can feel this difference, and I certainly felt it when I lived there. I agree with you that low-rise neighborhoods can also be impersonal. In fact, I would say that, they are likely to be impersonal if they are too low-density, because there are no destinations within walking distance and therefore no people walking on the streets. You have the most intimate scale in traditional neighborhoods, ranging from streetcar suburbs to older European neighborhoods. There are good pictures of tradtional scale urban neighborhoods at http://www.livablecities.org/. The people who run this web site say they want to focus attention on "on the need for public transit, bicycle lanes, and traffic calmed streets, for human scale architecture and mixed use urban fabric, for reviving the city center and creating public places." Judging from the pictures, when they say "human scale architecture," they do not mean highrises. Jan Gehl wanted exactly the sort of urban design shown here as an alternative to highrises.
. . . Having lived in Manhattan, just off West End Ave., I am familiar with BOTH high-rise and low-rise neighborhoods. From your various previous posts (here and elsewhere), I had assumed that you had lived, at least briefly, on the Upper West Side of Manhattan. The reason I mentioned familiarity with both high- and low-rise neighborhoods in my previous post, however, was to point out that others too, even those having a viewpoint different from yours, may also be familiar -- and maybe even more familiar -- with both kind of neighborhoods. Can't you feel the difference when you go from lower Fifth Ave. or from West End Ave. to the adjoining streets of nineteenth-century row houses? Can't you feel that you are moving from a more impersonal to a more intimate scale? I suggest that the great majority of people can feel this difference, and I certainly felt it when I lived there. I thought your questions were addressed in the fourth paragraph of my previous post, e.g., ". . . It isn't until such [low-rise] streets are enlivened with other types of buildings, including high-rises, that such [low-rise] blocks become less mechanical and [less] impersonal and . . . more truly personal, idiosyncratic, interesting, and pretty . . . "
But, also, see more directly below. It also seems to me that it's important not to confuse, as some (but not all) of your posts in this thread seem to do, "scale" (a structure's height) with its degree of "facelessness" (lack of articulation and visual permeability) and its degree of "impersonalness" (lack of "welcoming" connection to people on the street). The Chrysler Building, for example, is large-scale building, but the Chrysler Building is not "faceless" (as it would be if it had large blank or, even glass curtain, walls) or "impersonal" (as it would be if it had an utterly plain, grid-like facade, from top to bottom). The Chrysler Building is, rather, tall, magnificent and a wondrous delight! On the other hand, the new low-scale wall behind MOMA is both truly faceless and impersonal. So when people walk from a street with tall buildings to one with low buildings, they are only walking from a large-scaled street to a low-scaled one -- whether either street is "faceless" or "impersonal" has to do with the designs of the various buildings on it and how well they've been mixed. I agree with you that low-rise neighborhoods can also be impersonal . . .
Why you may prefer such neighborhoods, that doesn’t mean that those streets and neighborhoods having high-rise buildings are “faceless” and “impersonal,” and that many other people might not prefer such neighborhoods over the ones that you like, or that others might not find low-rise neighborhoods to be faceless and impersonal -- not to mention bland, boring, dull, tedious, oppressive, . . . There are good pictures of traditional scale urban neighborhoods at http://www.livablecities.org/. The people who run this web site say they want to focus attention on "on the need for . . . human scale architecture and mixed use urban fabric, for reviving the city center and creating public places." Judging from the pictures, when they say "human scale architecture," they do not mean high-rises. Jan Gehl wanted exactly the sort of urban design shown here as an alternative to high-rises. 1) Others are also entitled to their own preferences and to their own ideas of what constitutes human-scaled architecture. 2) There seems to me to be a certain mindlessness (“conventional wisdom”) and lack of reflection (impractical “utopianism”) about what people say, in general, about architecture and cities. 4) I suspect that if you actually polled people at PPS (and I’ve met a few), a good many of them (maybe even almost all) would be delighted to live in neighborhoods having high-rises – if they don’t already. 3) Many neighborhoods that are thought of as low-rise neighborhoods (e.g., Greenwich Village, Brooklyn Heights, etc.) actually contain high-rises. And whether a high-rise helps or hurts a neighborhood, so it seems to me, is largely a question of how the building is designed and the mix of buildings in the area.